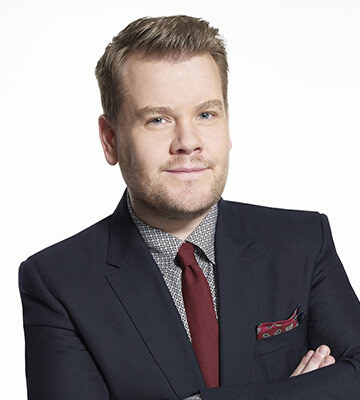 James Corden is a multi-faceted performer, host, writer and producer with accomplishments that span television, theater, film and comedy who took the reins of THE LATE LATE SHOW on March 23, 2015. Corden comes to American late night television with a growing list of award-winning and critically acclaimed credits. He is a Tony Award-winning performer on Broadway, a BAFTA-winning star of a UK television series, a feature film actor, and an acclaimed host, writer and producer in several genres of television. Corden hosts the BAFTA Award-winning UK sports-themed comedy game show “A League of Their Own” on Sky 1 and stars in, produces and writes the BAFTA nominated comedy thriller “The Wrong Mans,” which is available on Hulu and airs on the BBC. In 2013, Corden was awarded the Royal Television Society Award for Comedy Writer of the Year for his work on the show. Also, this year he will appear in the BBC television movie “Esio Trot,” alongside Dustin Hoffman and Judi Dench. Outside of his native England, Corden attracted international attention as the lead in the hit comedic play “One Man, Two Guvnors,” performing first in the National Theatre and the West End in London and then on Broadway, which earned him the 2012 Tony Award for Best Leading Actor in a Play. His additional theater credits include the worldwide tour of “The History Boys” in the role of Timms, which he also played in the feature film adaptation. On television, Corden starred as Smithy in the critically acclaimed BBC comedy series “Gavin and Stacey,” which he co-created and co-wrote. For his role, he earned the BAFTA Television Award for Best Male Comedy Performance in 2008 and the British Comedy Award for Best Male Comedy Performer in 2007. The series received the British Comedy Award for Best TV Comedy in 2008 as well as the National Television Award for Most Popular Comedy Programme in 2010. Prior to that, Corden starred in the British television series “Fat Friends” from 2000 to 2005, which earned him a nomination for the 2000 Royal Television Society Award for Network Newcomer On Screen. In 2011, Corden had a recurring role in the popular BBC science fiction series “Doctor Who” as Craig Owens, the Doctor’s roommate. In addition, Corden hosted the Brit Awards, the biggest event in the British music industry, from 2010 to 2014. Corden starred opposite Meryl Streep, Johnny Depp and Emily Blunt in the Golden Globe Award nominated feature film “Into the Woods.” His additional film credits include “Begin Again,” with Keira Knightley and Mark Ruffalo; “How to Lose Friends and Alienate People,” with Jeff Bridges; “Gulliver’s Travels,” with Jack Black; and “The Three Musketeers,” with Orlando Bloom. Over the course of his career, Corden has been awarded the Writers’ Guild of Great Britain Award for Comedy Writer of the Year, the South Bank Show Award for Comedy, the TRIC Award for Best Comedy and the National Television Award in for Best Comedy. Corden is from High Wycombe, England and currently resides in Los Angeles with his wife and children. Follow him on Twitter @JKCorden.